NEW BRITAIN - On a senior night where the New Britain girls basketball team delivered one of its most spirited efforts of the season, it was a Plainville underclassman who shined and helped the Blue Devils avoid an upset. Sophomore Jaida Vasquez finished with a double-double, pouring in a game-high 20 points to go with her 11 rebounds for the Blue Devils, who held off multiple comeback efforts from the Hurricanes in a 64-60 victory, the team’s third in a row, Monday night. Down by as much as 10 in the second half, the Hurricanes used a 3-point shooting spurt and a monster night from Tianna Sweeney, who finished with 19 points, to pull within one point late in the third quarter. But Vasquez and the Blue Devils (11-7) made multiple defensive stands down the stretch to seal the win, while New Britain missed on clutch free throws that could have tied the game. Maya Slisz converted an old-fashioned 3-point play to pull New Britain within two with 30 seconds remaining, and the Hurricanes’ defense forced a turnover on the ensuing inbounds pass, leading to free throw opportunities for Jada Hubbard, but she missed both free throws to keep Plainville ahead. New Britain’s defense kept prolific Plainville scorer Caitlin Barker scoreless through the first quarter, but the senior still managed to finish with 16 points in the winning effort. Samantha Lozefski added 11 for the Blue Devils, including a pair of clutch 3-pointers when New Britain was threatening to pull ahead in the fourth. 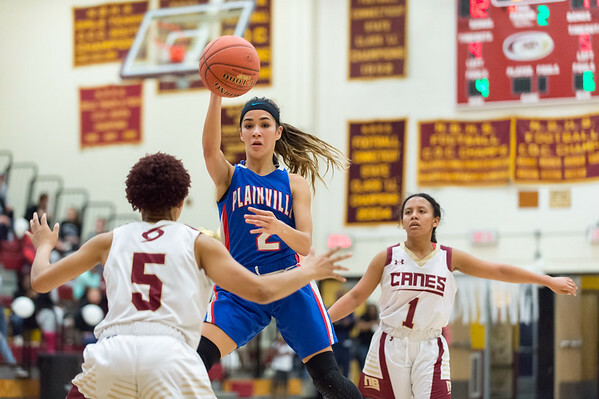 The teams traded 3-pointers early in the fourth quarter, as Lozefski hit two 3s in between triples from New Britain’s Asia Gaines and Slisz to keep Plainville’s lead at six. After a strong defensive stand by the Hurricanes, Plainville sent an inbounds pass out to the top of the key where Barker drained a 3 from two steps beyond the arc to push the lead back to nine. Still, New Britain wouldn’t quit. Gaines knocked down her third triple of the night with just over three minutes to go to pull the Hurricanes within two. With the deficit still at two in the final minute of the fourth, New Britain committed an intentional foul to give Plainville two extra free throws in addition to possession, which was enough to secure the hard-earned win. Plainville: Caitlin Barker 5-7-18, Kori Jones 2-3-8, Samantha Lozefski 4-1-11, Tessa Susco 1-0-2, Jaida Vasquez 6-6-19, Lillian Wazorko 0-0-0, Krystyna Miller 0-2-2. Totals: 18-22-64. New Britain: Brianna Clarke 1-0-2, Tianna Sweeney 6-7-19, Adrianna Faienza 0-0-0, Asia Gaines 3-0-9, Raven-Symone Jarrett 0-5-5, Maya Slisz 6-4-17, Toni Mills 0-0-0. Totals: 20-16-60. 3-Points Goals: Lozefski (P) 3, Vasquez (P), Jones (P), Barker (P), Gaines (NB) 3, Slisz (NB). Records: New Britain 4-13, Plainville 11-7. Posted in New Britain Herald, New Britain, Plainville on Monday, 4 February 2019 21:43. Updated: Monday, 4 February 2019 21:45.